is the one that can be read aloud and go unheard. not its illumination of me. afterwards, after you sink between them. I learned that it is always arriving. over the knowledge that you are lost. and what its very light withers. "Confession," "Sunrise and Silence," "Only at the End," "In This Valley," and "Boldness" translated by Arthur Dixon. "VI" and "Day Is Born" translated by Katherine M. Hedeen. Hugo Mujica studied Fine Arts, Philosophy, Philosophical Anthropology, and Theology. He has published over twenty books. His latest essays are: “La palabra inicial: La mitología del poeta en la obra de Heidegger,” “Flecha en la niebla,” “Poéticas del vacío,” “Lo naciente: Pensando el acto creador,” “La pasión según Georg Trakl: Poesía y expiación,” “El saber del no saberse,” and “Dioniso: Eros creador y mística pagana.” Solemne y mesurado and Bajo toda la lluvia del mundo are his two short story collections. His Poesía Completa: 1983-2011, which includes the ten verse collections he has published up to that date, was published by Editorial Vaso Roto along with two further volumes that include almost all of his essays. He has also published the verse collections Y siempre después del viento, Cuando todo calla (XIII Premio Casa de América de Poesía Americana), and Barro desnudo with the Spanish editorial Visor. He also has several personal anthologies published in twenty countries; some of his books have been published in English, French, Italian, Greek, Portuguese, Bulgarian, Romanian, Slovenian, Hebrew, and Maya. Katherine M. Hedeen is the National Endowment for the Humanities Distinguished Teaching Associate Professor of Spanish at Kenyon College. She specializes in Latin American poetry and has researched and translated numerous contemporary authors from the region. Her translations appear extensively in prestigious American and British literary journals. Her published book-length translations include collections by Juan Bañuelos, Juan Calzadilla, Marco Antonio Campos, Luis García Montero, Juan Gelman, Fayad Jamís, José Emilio Pacheco, Víctor Rodríguez Núñez, and Ida Vitale. She is an associate editor of Earthwork’s Latin American Poetry in Translation Series for Salt Publishing. 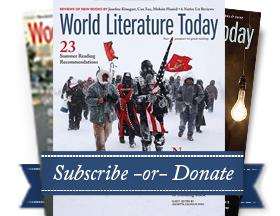 The third issue of LALT features the debut of our permanent section devoted to Indigenous Literature with writing in languages from Mapudungun to Tzotzil, as well as remarkable short stories from Cristina Rivera Garza and Yoss, the rising star of Cuban science fiction.